The good: Glucomannan has proven through studies and research to help weight loss. The bad: It has no thermogenic ingredients and only a single ingredient of glucomannan with a low dosage. The manufacturer has a shady past which increases the doubt about the product. The bottom line: One cannot be sure that weight loss can be achieved on using Lipozene. Price: $35 for 120 softgels, a 20 day supply. The Lipozene manufacturer’s website claim that their product is ?clinically proven to reduce body fat?. Lipozene pills contain a single ingredient called Glucomannan. Lipozene has become popular and recognized only because of the infomercial about the product that is aired repeatedly late at night and not because it is a very great product. The testimonials by the so called users who have reduced weight are not motivating enough to spend on the product. Lipozene contains one single ingredient called Glucomannan. Glucomannan has proven through studies and research to help weight loss. However, the dosage recommended as per the study is at least 2000mg. but Lipozene contains only 1,500 mg of Glucomannan. As per the study with a daily dosage of 2 and 4 grams, one can reduce 5.5 pounds during a period of eight weeks. This is no significant amount of weight loss. The infomercial claims that Lipozene is "Clinically proven to help you lose pounds of Body Fat and Weight WITHOUT a change in lifestyle." This is misleading because what they actually mean to convey is that the ingredient in Lipozene, Glucomannan has been clinically tested and proved to help aid weight loss but with a different dosage. 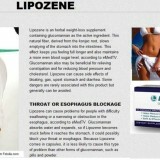 They do not mention that their product Lipozene has not been clinically proven to promote weight loss. One has to be extra cautious when ordering Lipozene. The ordering procedure is such that it is easy to opt for autoship option. Once you do it, you will keep on receiving the product every month and your credit card gets billed automatically. So, if you intend to purchase Lipozene ensure that you categorically state that you do not want the autoship option. They will try to convince you, but do not yield to their tactics. The manufacturer of Lipozene is Obesity Research Institute LLC. They were also the manufacturers of Propolene. Propylene came under public ire with lots of complains registered between from 2004 to 2006. They have launched a new pill with the name of Lipozene. This new name is only a pretense to avoid the anger from the innumerable customers whose cards were charged without their permission. Obesity Research Institute LLC, the manufacturer of Lipozene has had a stand-off with the FTC too and was ordered to pay $1.5 million to consumers. The reason being the Obesity Research Institute?s outrageous contentions regarding the result the consumers can achieve on using their product. This was aired constantly as an infomercial. One cannot be sure that weight loss can be achieved on using Lipozene. It has no thermogenic ingredients and single ingredient of glucomannan is with a low dosage. This creates a suspicion regarding the effectiveness of the pill, though it may help weight loss of a few pounds when used over a period of many months. More importantly, the manufacturer has a shady past which increases the doubt about the product and suggest other weight loss options. If you asked me to recommend one diet pill that seems to work for people like you and me, it would be Phentramin-d. It’s safe to use compared with prescription Phentermine, and it’s easy to buy online without a prescription and no privacy-invading, expensive doctor visits. It’s good at suppressing hunger to help you stop eating so much, and you’ll find you have more energy when you take Phentramin-d. So, overall, we can recommend it easily. This product is a farce. I haven’t lost any weight or felt any differently than when I was just watching my eating habits. To purchase this product is an extreme waste of money, time and effort. This is the biggest waste of money. If you want to lose weight, it tells you to take 2 pills 3 times a day. If you, it ends up costing you about $150 a month. For that kind of money, the results are lousy, just a couple of pounds. Sucked! I didn’t loose any weight at all on it. It didn’t help me feel energized, nothing!!! I’ve tried lipozene for about two months, and it did absolutly nothing for me. Infact I didn’t loose any weight once so ever. If your looking for a great diet pill i recommend using Stacker Products, I switched to stacker xplc and it works amazingly great! I lost weight and helps you control those hungry snack food cravings! thank u for stopping me to buy this product . i saw it in tv its sounds good but i guess i not. Okay again This product does not work at all. It’s a complete waste of your money I have taken for about two months in the summer and it did absolutly nothing… Then i switched to the stacker products and they work great. I recommened stacker xplc, they do give you a lot of energy also… but They had a result of me loosing 10 pounds in one month! Its great… but Lipozene is not worth it. I have been taking this for a week or so i did lose a little bit of weight but i did some research and the only thing in this is konjac root which is a FIBER SUPPLEMENT and that is all. For all of you who do like the results save yourself some money and get a fiber supplement, you can probably find one with konjac. I wont be purchasing this again results are not very significant. 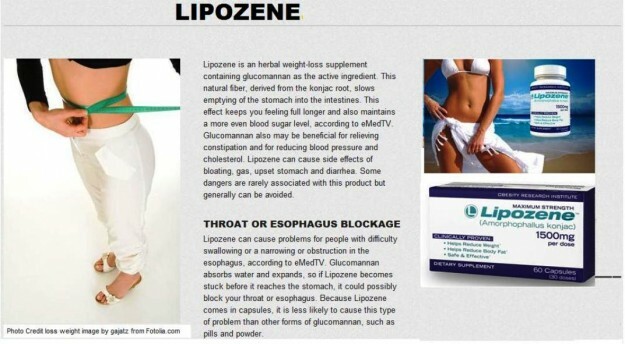 I have not tried Lipozene, but through recent research of Cushing Disease, this sounds like a deadly diet pill to me. With the first 30 pills (bottle) I lost 11 pounds. the 2nd bottle i lost nothing! I’ve been taking lipozene for a week and i feel nothing different! I feel tired, and even more hungry. For some reason it made me feel really bloated i think the Alli pill worked better i was able to lose 20 pounds in one month. This product was a complete waste of money. I am going to call them and get my money back! I have been watching what I eat, keeping my total # of calories low and still haven’t lost any weight! The stuff is a joke. The ordering process convinced me from the start that the company was bogus and greedy. Don;t buy it! I just bought this today, and now I wish I hadn’t….every single review I have read is bad….NOT excited about wasting my money….Word of mouth had been nothing but good!!!! I’ve ordered lipozene and it’s on it’s way. Even though the reviews are kinda shaky i vow to give it a fair try w/ my body. Everything doesn’t work for everybody. my stomach isn’t agreeing with lipozene is any one else expering this? I have used one bottle worth as of now. Which is 30 pills. I didn’t feel any energy increase accept for the first day. Most likely due to something new in my system. I am now bottle two another 30 pills supply. I haven’t weighed myself. I am taking two before every 4 to 5 hours. Three times a day around meal time. I had gone to the doctor before starting this & weighed around 190. I am going back to the doctors again, unrelated issue on Monday, I will be weighed as normal. I guess I will see if there is a difference in weight. I don’t really see anything or feel anything. I thought I noticed it a little, but I think it is just from being on my back during sleep. Nothing major. I’ll keep informed. So far, I can’t say yes or no. But I got wrangled into $145 worth of pills. 3 30 pills supply & 2 60 pills supply plus3 30 pills supply of MetaboUp. I ordered Lipozene then searched the internet for reviews. I didnt like what I read so I sent it back without opening it. They claim that they never recieved it and refused to refund my money. They are a scam.